Kevin Dunn, C.S.C.S., CEO of TEST Football Academy, is among the best at getting athletes ready for the NFL. 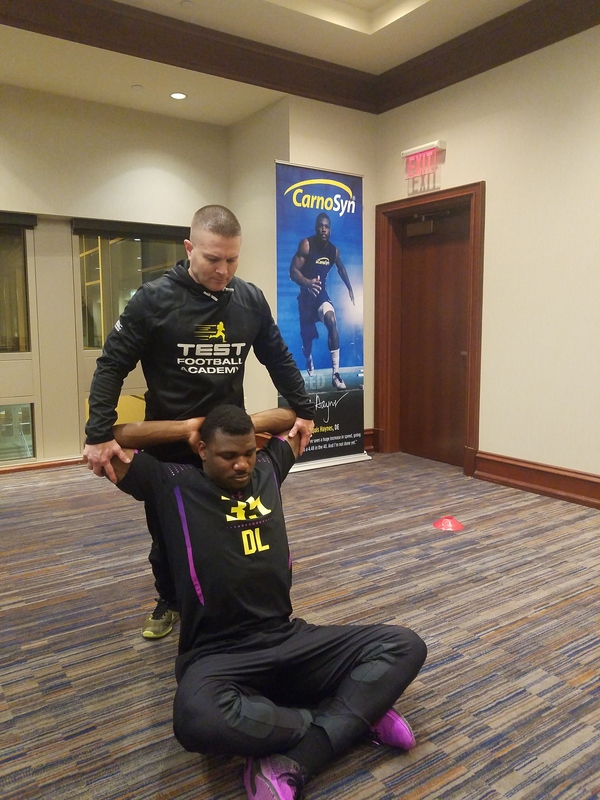 Now in our 20th year, the TEST Football Academy’s NFL Combine Prep Program attracts athletes looking to play professional football and has a success rate of 250-plus athletes delivered to professional football, with 61 current players on 25 NFL teams. Our program involves eight to 10 weeks of training to maximize their performance on the 40-yard dash, 20-yard shuttle, 60-yard shuttle, three-cone drill, vertical jump, broad jump, and the 225-pound bench press. Don’t assume Olympic lifts are the only exercises that can enhance power output. Using tools like your body weight, medicine balls, and weighted vests can also be valuable. Power moves should fit in after your warmup and before your lift to ensure all move­ments are perfectly executed. The 225-pound bench press is an endurance test for most athletes preparing for the NFL Combine, regardless of their position. We use an undulat­ing periodization schedule—cycling endurance, strength, and power ranges with a unique cadence and time under tension each workout. We use Keiser racks to add resistance using air pressure to engage all the smaller sta­bilizing muscles, and imple­ment other tools like wooden blocks to maximize fatigue in a dropset while protecting the shoulder joints. Proper nutrition and sup­plementation are an absolute must when you are looking to take your performance to the elite level. For our guys, it’s important to have specific calorie and macronutrient plans customized to their unique goals. We also incorpo­rate sports nutrition products, specifically ones that enhance recovery and help act as a buffer against lactic acid—the enemy of peak performance. Look for a supp with Car­noSyn beta-alanine to support the synthesis of muscle carnosine, which acts as a buffer against lactic acid and delays the onset of muscle fatigue and failure. CarnoSyn helps our athletes go harder and longer. We are using sus­tained-release SR CarnoSyn at higher doses on a daily basis (between 9.6 and 11.2g per day) to keep levels consistent in the body. On days when we’re ask­ing these guys for five hours of training throughout the day, it’s important to have a supp with sustained release so they can remain effective all day long.